The pineapple (Ananas comosus), the second most popular tropical fruit in the West, is adored for its sweet, juicy yellow pulp as well as for its refreshing taste. Pineapples are in season from March to June, however, modern agricultural techniques have made the fruit available throughout the year in most parts of the world. The fruit boasts significant antioxidant and anti-inflammatory activity due to the presence of impressive amounts of vitamin C and manganese as well as small amounts of copper. It also contains a special protein-dissolving enzyme called bromelain which aids in the digestion of meat. However, bromelain may worsen gastritis symptoms as well as acid reflux disease and is the reason why many people avoid the fruit altogether. There are some studies that suggest that eating pineapple may reduce inflammation at the level of the colon and joints, improving conditions such as colitis and arthritis. Except for a few B vitamins, other nutrients in the fruit are in too little amount to count towards any health benefits. Should you or shouldn’t you eat pineapple if you have stomach problems? There is no definitive answer to this question. While some people find pineapple soothing for the stomach, others may experience severe heartburn, stomach cramps and irritation of the stomach lining soon after consumption. Both the benefits and the troubles are a result of the fruit’s bromelain content, an enzyme which helps dissolve protein and is found only in pineapple. 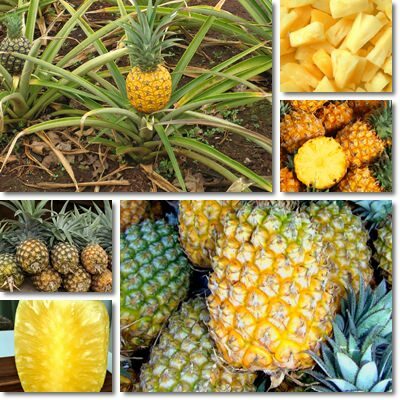 Basically, bromelain is what upsets gastritis sufferers, causing their condition to occasionally evolve into ulcer. The fact that digestive complaints worsen following consumption may also be related to the fruit having an acidic pH. At the same time, research shows bromelain boasts therapeutic effects and stands out as a potent anticoagulant, antioxidant and anti-inflammatory. According to research, the enzyme may hold benefits for cardiovascular health, preventing blood clots and helping break down cholesterol buildup. Moreover, it has been theorized that it has an immune-modulating action with potentially beneficial effects on asthma and allergy disorders (Properties and Therapeutic Application of Bromelain: A Review). The enzyme in pineapple is believed to posses anticancer activity and help improve symptoms of rheumatoid arthritis. Studies suggest it can modulate elements of the immune system and has antibacterial properties as well as anti-inflammatory and analgesic effects. The pain-relieving effects of the enzyme may be one of the reasons why some people report eating pineapple makes them feel good. At the same time, bromelain can have an irritating effect on the stomach lining and cause stomach upset or worsen an existing gastritis. For example, it has been reported that eating pineapple leads to heartburn, bloating, stomach cramps and an overall feeling of unwell. Pineapple contains not only bromelain, but also vitamin C and manganese, all three powerful natural antioxidants which offer protection against harmful reactive oxygen molecules called free radicals that may damage cells and DNA. Free radicals damage cells and, in some instances, cause them to mutate by making them live indefinitely and keep on multiplying, thus leading to tumours and cancer. Antioxidants in the fruit protect against cancer-causing cell mutations, especially of the colon. The anti-inflammatory properties of pineapple are partly a result of its vitamin C content, partly a result of the enzyme bromelain. Bromelain has been found to exhibit an anti-inflammatory action on the colon and, according to some studies, it can improve conditions such as colitis. It is also shown to be effective against arthritis joint pain. However, eating pineapple alone may not lead to such significant improvements of serious medical conditions. Taking bromelain dietary supplements or extract is said to be much more efficient than consuming the fruit in reducing pain and inflammation. Bromelain is found largely in the pineapple stem, a portion often discarded. The pulp contains small amounts, enough to upset a stomach, but insufficient to visibly reduce inflammation and relieve pain. Pure bromelain extract has also shown results in the treatment of breast cancer. Overall, eating pineapple has its benefits. For instance, it is rich in vitamin C. About 100 g of fresh pulp supplies us with 80% of the RDI of the nutrient, a powerful anti-inflammatory, antioxidant and antibacterial agent. Vitamin C-rich foods such as pineapple stimulate collagen production and are thus efficient in preventing wrinkles and saggy skin as a result of old age. In addition to reducing inflammation, vitamin C also reduces the frequency, duration and overall severity of colds and bacterial infections by supporting immunity. As an antioxidant, it protects against free radicals, reactive oxygen molecules which, among other things, promote plaque forming on artery walls and consequent atherosclerosis, a major cause of death among adult males especially. Also, free radicals are known to cause asthma attacks, colon and other cancers, osteoarthritis or rheumatoid arthritis. Despite claims of insufficient research, one thing is clear: people enjoying a diet rich in vitamin C are healthier and less likely to suffer from chronic diseases. Pineapples are a good source of B vitamins as well and, as mentioned above, an excellent source of manganese (40% of the RDI), a mineral which adds to the antioxidant effects of the fruit. B vitamins contribute to digestive health and support brain and nervous system activity. 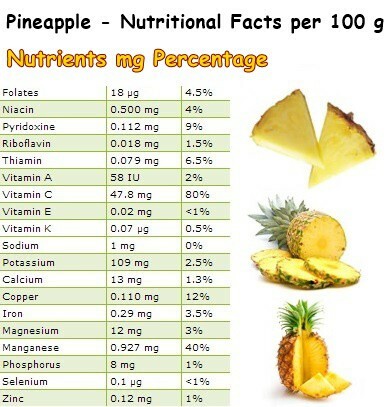 Overall, the pineapple is an above-average nutritious fruit. Its fresh, tropical aroma and sweet, juicy pulp make it extremely enjoyable fresh or canned, in salads or as a side dish to meat. And the fact that it grows close to the ground (pineapples do not grow on trees) makes it even more delightful. Nevertheless, it has been shown that certain farmers use excessive amounts of fertilizer and carcinogenic pesticides to produce a good yield and force the fruit to ripe using an organic plant hormone (usually ethylene). They fertilize their crops to such an extent that local water supplies are in danger of being contaminated with pesticides and rendered unsafe for drinking. As much as I enjoy pineapple, I do not eat it on a regular basis because I know the amount pesticides and fertilizers crops are receiving to produce a good yield, sacrificing the nutritional value of the fruit, soil and water supply quality. Because an overworked soil will also yield less nutritious food.